Uganda is Africa’s premier bird watching destination, with over 1000 species of birds and a combination of Albertine Rift endemics, 'old forest' birds and papyrus species. This safari is for the avid birder who wants to tick off at least 100 new species. From the not-so-hard-to-find shoebill to the Nkulengu rail, you will be astounded how many new birds species you'll see. Combine this with chimpanzee and gorilla trekking. You'll be picked up when you arrive at Entebbe International Airport (ETT) and driven to The Boma Guesthouse in Entebbe, where you'll spend the night. Dinner and breakfast are included. The four to five hours’ drive to Fort Portal takes you via the rural towns of Mityana, Mubende and Kwenjojo before entering the town of Fort Portal through an attractive landscape of rolling hillsides with tea plantations and the Ruwenzori Mountains in the background. After lunch in Fort Portal, you'll cross the eastern wall of the Rift Valley towards the settlement of Karagutu, where you'll turn off to the Semliki Valley Wildlife Reserve – one of the best birding areas in Uganda (350+ bird species). You'll arrive at the Semliki Safari Lodge by mid-afternoon. On your first evening, you're welcome to join in a night game drive with spotlight (in a shared open-sided lodge vehicle) in search of nocturnal wildlife and bird species, such as standard-winged and pennant-winged nightjars. Overnight at Semliki Safari Lodge, with your meals and drinks included. Following an early breakfast, you'll be transferred to the fishing village of Ntoroko from where you'll go on a birding boat cruise on Lake Albert. The swamp at the southern end of Lake Albert is one of the best spots in Uganda to observe the much sought-after and rare shoebill stork. You'll have a chance to observe rare species such as grey-headed gull, lesser Swamp-warbler, Spot-breasted ibis, Senegal coucal and African green ibis. Some other remarkable birds that can be seen are blue-cheeked bee-eater, blue-headed coucal, goliath heron, yellow-billed stork and grey-crowned crane. After your boat trip, you'll return to Semliki Safari Lodge for lunch. Mid-afternoon, you'll go on a wildlife/birding ride in the Semliki Valley Wildlife Reserve in a private 4x4 with an experienced naturalist driver-guide. You'll have a chance to observe species such as sulfur-breasted bushshrike, red-shouldered cuckoo shrike, White-browed Scrub-robin, blue-naped mousebird, striped kingfisher, white-breasted robin, bateleur and snake eagles, and helmeted guineafowl. In the evening you'll go on another night drive with spotlight (in a shared open-sided lodge vehicle) in search of nocturnal wildlife and bird species. Overnight at Semliki Safari Lodge, with your meals and drinks included. Following an early breakfast, you'll drive about 1,5 to two hours to the Semliki National Park with a packed lunch. The park, which has 430+ bird species, is the eastern extension of the vast Ituri Forest of the Congo Basin in the Democratic Republic of Congo (DRC). Forest walks in the Semliki National Park will provide you with some of Africa’s best forest birding, including white-crested hornbill, red-billed dwarf hornbill, piping hornbill, Congo serpent eagle, yellow-throated nicator, red-rumped tinker bird, black winged oriole, black collared lovebird, Zenkers honey-guide, great blue and Ross’s turacos. In the afternoon you'll visit the Sempaya Hot Springs, spurting bubbling water and steam up to two meters high. Before returning to the Semliki Valley Wildlife Reserve, you'll pass via the Sempaya-Ntandi Road, a six-kilometre section of public road that runs through one of the loveliest tracts of forest in Uganda and provides views of birds and monkeys high up in the forest canopy. Overnight at Semliki Safari Lodge, with your meals and drinks included. After breakfast, you have a two- to three-hour drive to Kibale Primate Lodge where you'll have lunch. You'll go chimpanzee trekking in the afternoon when you have a better chance of seeing the chimps on the forest floor. Kibale has wonderful forest and papyrus birds but you'll have to rely on calls and the odd glimpse through the forest canopy. Rare species include the papyrus gonolek, white-winged warbler, white-collared olive back and papyrus canary, white-spotted flufftail, yellow-spotted barbet, hairy-breasted barbet, yellow-billed barbet, western nicator, grey-winged robin-chat, white-tailed ant-thrush, brown-backed scrub-robin, Black-and-white Shrike-flycatcher, brown-throated wattle-eye, superb sunbird, Brown-crowned tchagra, Bocage’s Bush-shrike, black bishop, white-breasted negrofinch and black-crowned waxbill. Overnight at Kibale Primate Lodge, with your meals included. After breakfast at the Kibale Primate Lodge, you'll set out for the Kibale Forest at a leisurely pace via the Crater Lakes area to Kasese town, the second most populous center in Western Uganda. The road passes through fertile agricultural land and follows the lower slopes of one of Africa’s largest mountain ranges – the famous Rwenzori Mountains. 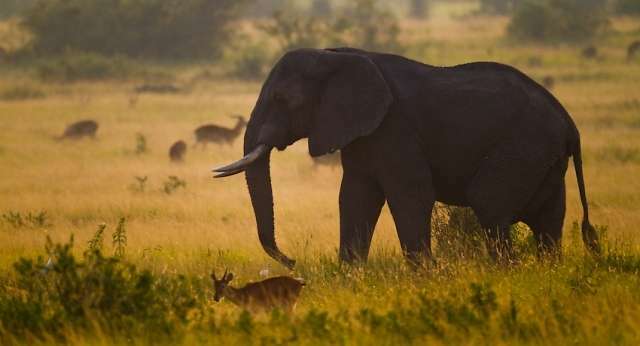 You'll cross the equator and pass through the Queen Elizabeth National Park (600+ bird species) where the Uganda kob is abundant and you may see elephant or buffalo in the distance. After lunch at the Mweya Safari Lodge, you'll go on a boat cruise on the Kazinga channel, leaving at 3pm. The 32-kilometre Kazinga channel is a dominant feature of the Queen Elizabeth National Park and links Lake George with Lake Edward. The channel attracts a varied range of animals and birds and one of the world’s largest concentrations of hippos year round. During the cruise, you may spot skimmers, striated heron, African spoonbill, African crake, three-banded plover, marsh sandpiper, green sandpiper, wood sandpiper, grey-headed gull, lesser swamp-warbler and many others. Overnight at the Kyambura Gorge Lodge, with your meals and drinks included. After breakfast at the Kyambura Gorge Lodge, you'll leave the Northern section of the Queen Elizabeth National Park via an 80-kilometre dirt road (1,5 to two hours, depending on road conditions) towards the Congolese border town of Ishasha. Although the road passes through the Queen Elizabeth National Park, this is a public road. Enjoy your packed lunch at a quiet spot at the Ishasha River before checking in to the Ishasha Wilderness Camp. In the afternoon you'll go on a wildlife and birding drive on the Ishasha Plains in a private 4x4 vehicle with your driver-guide. As the sun sets, return to the Ishasha Wilderness Camp for the night, meals included. Spend the morning after breakfast on a last game drive in Queen Elizabeth National Park before driving to Bwindi Impenetrable Forest National Park (two to three hours away) in time for dinner. Bwindi is a bird watcher's heaven, with 350 species of birds and 90% of all Albertine rift endemics. An experienced bird watcher can identify up to 100 species in a day. Birding takes place along the Buhoma Waterfall Trail and along the bamboo zone and Mubwindi Swamp trail in Ruhija. Overnight at Gorilla Forest Camp, with your meals and drinks included. This is the morning for your mountain gorilla trek. Spend your allotted hour with these giant primates and return to Gorilla Forest Camp for a late lunch, with time to relax in the afternoon. Overnight at Gorilla Forest Camp, with your meals and drinks included. The last day of your birding safari through Uganda will be spent looking for the species you haven't seen yet. Look out for some of the 23 Albertine Rift endemics, such as the short-tailed warbler, rusty-faced woodland warbler, bar-tailed trogon, Gruer’s rush warbler, Wilcock’s honey-guide, yellow-eyed black fly-catcher, Kivu ground thrush, dusky crimson wing and white-tailed blue monarch, as well as seven IUCN red data listed species that are difficult or impossible to see in any other part of East Africa. Overnight at Gorilla Forest Camp, with your meals and drinks included. Your flight back to Entebbe leaves at 10:55am and arrives at Entebbe an hour later. You'll be in time for lunch back at The Boma, where you'll spend the afternoon before being transferred to Entebbe International for your connecting flight.